Since a scale, by definition, measures the weight and not volume of things, you are right to wonder how your scale can show fluid ounces. In general, there are two approaches. Some scales simply assume that the density (weight divided by volume) of what is being measured is the same as that of water. One fluid ounce of water weighs 1.0425 ounces, so if you want to measure a cup of water, you can weigh out 1.0425 X 8 = 8.34 ounces by weight. The problem is many cooking ingredients don't have the same density as water. Canola oil, for example, has a density that is just under 0.92 times that of water, so if you weigh 8.34 ounces of oil you will end up with about 8.7 fluid ounces instead. Some kitchen scale manufacturers get around this by having a selection of common kitchen ingredients to choose from - e.g. milk, oil, flour, etc. - that can be chosen from a menu. The scale then uses the density of whatever you told it you were weighing to calculate the volume. Just be careful to set the scale appropriately. If you are trying to measure a cup of flour, with a density around 0.58 of water, and you don't set the scale correctly you could end up with a lot more flour than you wanted. Even with a scale that gives you the option to choose what ingredient you are measuring, there can be problems. The most notorious is salt. Fine grain salt can weigh almost twice as much per unit of volume as a large-grain flaky salt so if you only have one choice for salt, you could end up wrong. 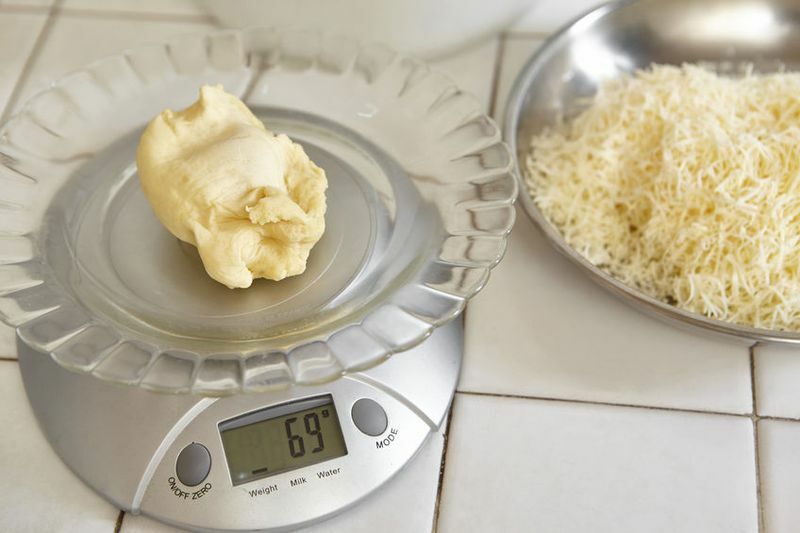 Different cheeses have different densities whether they are grated or not. As a general rule, I wouldn't trust my kitchen scale to weigh out volume measurements. Instead I would either use the traditional measuring spoons and cups, or actual weight, if it is given.